Hot ashes are extremely dangerous. Many people assume the risk of fire disappears as the flames die down, but even after several days of your last fire the wood ashes retain enough heat to ignite a forest fire, house fire, or other combustible materials in your trash can if improperly disposed. Special steps need to be taken after the fire has burned out in order to protect your family and the community. Once the ashes have cooled completely, you can place them in a plastic bag, tie it securely, and dispose of it in your curbside trash can. 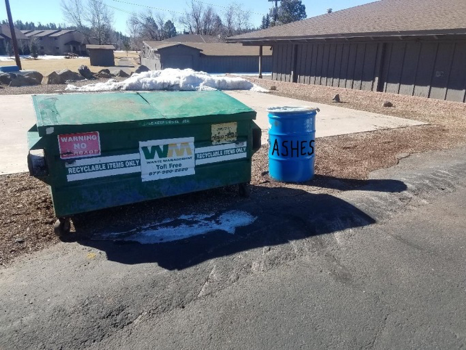 OR you can now use our Blue Ash Can that will be located in the back of the Pinewood fire station next to the recycle bin to store your ashes for your convenience. If the steps are not followed, you may be putting your family and community at risk. Houses have burned, garbage trucks have caught on fire, and people have been seriously hurt. If you are not positive if the ashes are completely cool, just wait longer…it might save a life. 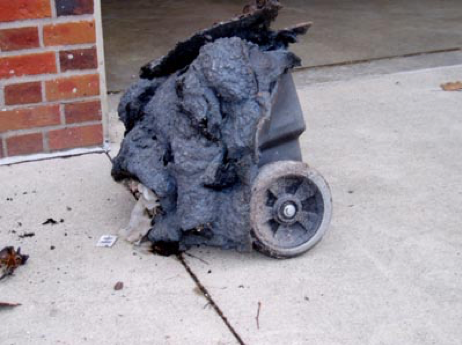 The damage above resulted when hot ashes were placed in a plastic trash container. New Ash Can for residential use.